Note: The next series of stories here on Forgotten Fiberglass are going to focus on the brochures and associated customer communication of the Atlas / Allied Fiber Glass Company. We’re lucky here at Forgotten Fiberglass to have become friends with Darren and Julie Crispin whose family created the “Multiplex” line of cars back at the turn of last century and resurrected the make in the ‘50s as well (some using the Atlas / Allied body). 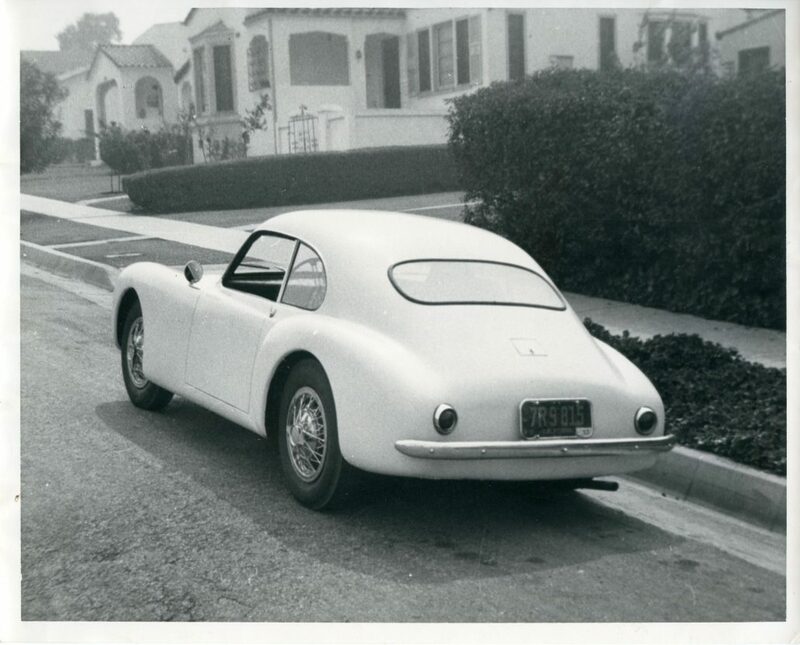 In addition, we’ll be featuring some of the historic Atlas and Allied documents from Dennis and Brandon Kunicki (father and son) who have owned an Allied Sports Car since the early ‘60s, as well as materials from automotive historian and good friend Alden Jewell. Thanks to each of these families and folks for their support of Forgotten Fiberglass! Rear view shows customer’s car with MG rear bumpers and Pontiac taillights. ’49 Ford tail lights are furnished with body but Pontiac tail lights are also available if desired. The doors shown are secured by heavy duty steel hinges, built to withstand strain of daily usage. Grill can be obtained with chrome bar or cast aluminum 1″ squares approximately 1/2″ thick. Full hood opening hinged at front with heavy duty steel hinges, and fastened with standard automotive hood catch. Allied Fiber-Glass bodies are of light weigh, sturdy construction, non-corrosive and dent-resistant. Reduced body weight results in a lowered center of gravity and therefore increased maneuverability and speed, also less wear and tear on brakes, tires, etc. The advanced Continental Styling and the extra smooth finish make the Allied Swallow body beautiful as well as practical. As with every image here at Forgotten Fiberglass, use your mouse to click on the brochure image below and make it larger on your screen. From the archives of the Crispin family emerged the 3 original black and white photos used in this brochure – high quality and 8″ x10″ in size. Simply amazing. Each of these photos is shown below. As with every photo here at Forgotten Fiberglass, use your mouse to click on the photo and make it larger on your screen. Who Owned What: When, Where, and How? 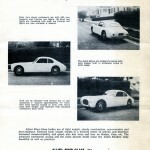 Whereas the first brochure discussed in an earlier story showed a photo of a dark colored Allied Swallow and one picture annotated with information (including a basic drawing on the third page), this brochure is more refined and has several photos and views of a nicely finished Allied Swallow Coupe Sports Car. 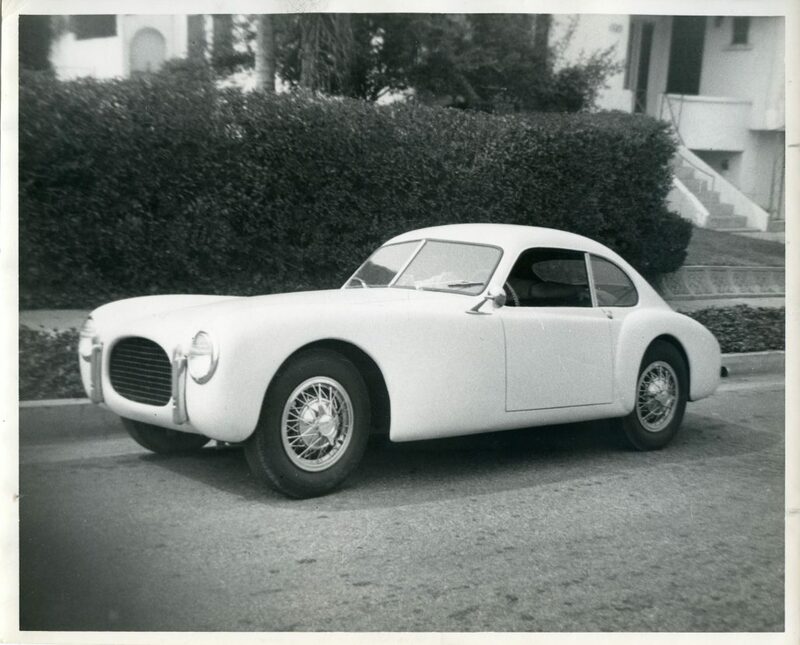 The earlier darker colored Allied Coupe was actually Bill Burke’s personal car painted in his favorite color – “Burple.” This was a dark purple he frequently used on his sports and race cars that he named himself, or was named after him. 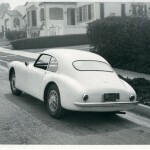 The owner and builder of this light colored MG-TD based Allied shown in this brochure is unknown and the whereabouts of this car are unknown today. And for reference purposes, the year shown on the license plate is 1953. Thanks again to the Crispin and Kunicki families as well as Alden Jewell for helping make this story possible. 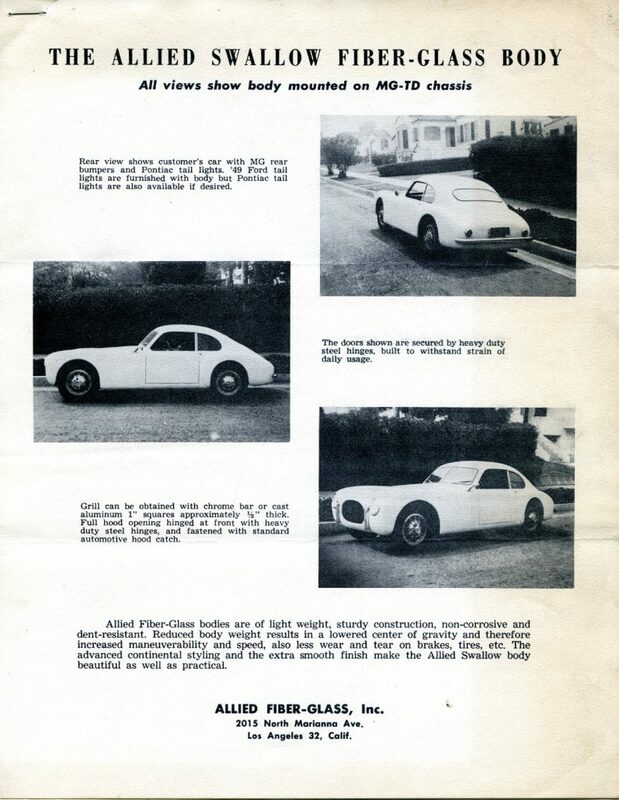 And…we’ll be on a roll for a few more stories about Allied Fiberglass and the brochures and sales papers utilized to market their cars and company in the near future. 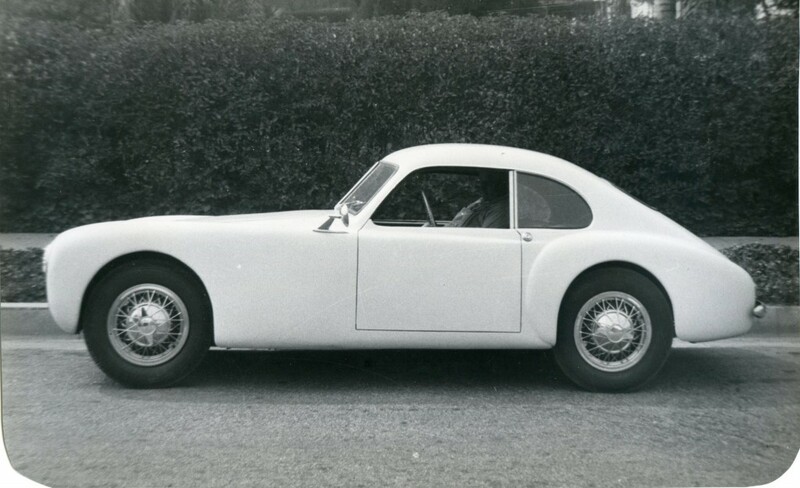 A great looking car with a strong Aston Martin DB3 influence. 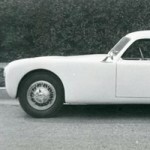 The DB 3 was introduced in 1951. “Burple” was a popular hot rod color in the 50’s and 60’s, that was a mixture of Burgundy and Purple. In May 1965 I got married and moved to East 13th St. in Berwick, PA. In August of that year I bought a 1959 AH Sprite and I was already driving a 1958 Morris Minor for 3 years. I began going to car shows and remember seeing the Coupe and Roadster at Crispin Field at one of the Antique Automobile Club shows. 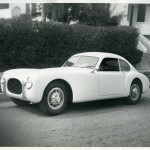 I was fasinated by the cars, especially the Coupe as I saw the Italian styling essence of the car. At the time, both cars were in driveable condition but were in quite rough condition. I would see one or the other around town occasionally and then much later when I had a British repair and restoration shop was glad to see them at a show and they were restored to a nice condition. I always wondered what might have been had these cars been manufactured in quantity. I was married in May 1965 and moved to East 13th St. in Berwick, PA. In August 1965 I purchased a 1959 AH Sprite and my dad bought a 1960 AH Sprite. 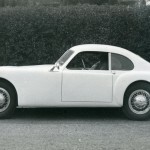 Having driven and 1958 Morris Minor for the previous 3 years, I was in love with the Sprite as it handled so well and having the same general mechanical parts as the Morris, I had already purchased several Morris Minors for parts. I began going to shows and first saw these cars at a show at Crispin Field. I was impressed by the coupe and had seen both cars driving around town on occasion. In 1976 I started my own British and foreign car repair and restoration shop. I later saw the Crispin cars as I called them and they had been restored to a nice condition much to my approval (although no one needed my approval). I tried to post this once and I didn’t think it went in so if this is a duplicate, please excuse me as I really wanted to comment on these cars as I always wondered what would have been if these had made it to great production figures. Pingback: 1954 Allied--So What Is It?